The desert is vast and still. 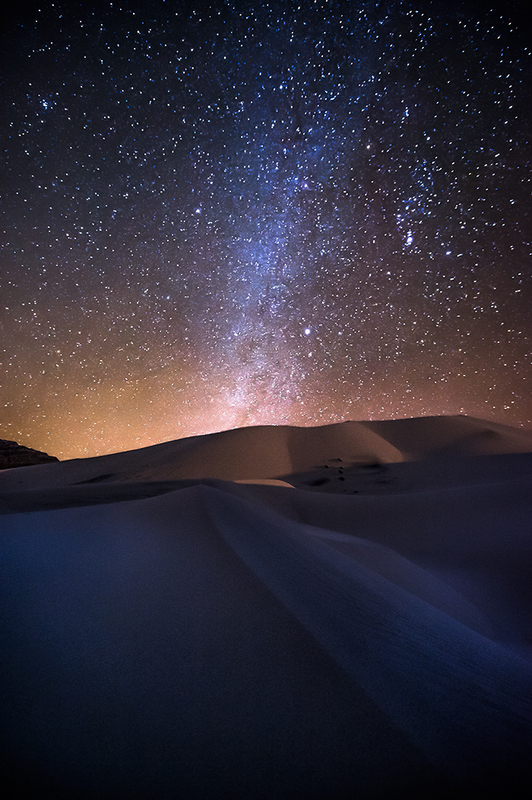 Silence reigns under the thousand stars. Dawn is around the corner, and the Bedouins have just started to awake. Soon, they will feed the camels and put out their wares for trading. 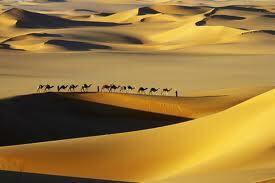 Soon, the sun will shine intensely upon the sandy dunes and the dry desert wind will pick up traces of the spices, mixing it with the dust and the scent of Morocco, filling the air with the riches of the ancient spice route and the mysteries of the desert. That is the promise of L’Air du Desert Morocain Eau de Toilette Intense, a unisex fragrance by Tauer Perfumes. And it is a promise that it delivers upon, lock, stock and ten roaring barrels. It is an incredibly impressive perfume, created by a Swiss scientist who has absolutely zero formal training in perfume making, and it explains why both L’Air du Desert Marocain and the Tauer line of perfumes itself have become such a massive hit. Tauer took a unique approach to marketing his fragrances, as have many indi [sic] perfumers. He had no big ad budget for marketing, he didn’t have a relationship with Barneys or Bergdorf or any other big department store that could put his more luxurious perfumes in front of customers, so he went straight to the internet. Marketing directly one on one, to perfume bloggers, fragrance forums, Tauer worked tirelessly to get his fragrances in front of the consumer that would appreciate them the most and then start working to get the knowledge of his great creations out in the world – the perfume community. Once we love something, we talk about it. Tauer was a blogger too, sharing with us, becoming a part of our community because, well, he was, he was completely one of us. Tauer’s perfumes are inspired by his travels – Lonestar Memories is the American west, leather and old jeans. Zeta is an ode to the gorgeous linden blossom – all sunshine, with no shadows, the best summer day of your life. 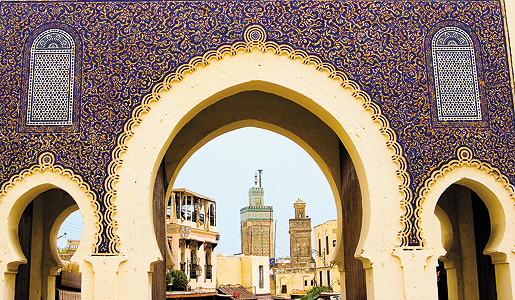 Le Maroc Pour elle is the smell of Morocco in the evening air. So too is L’Air du Desert Marocain. 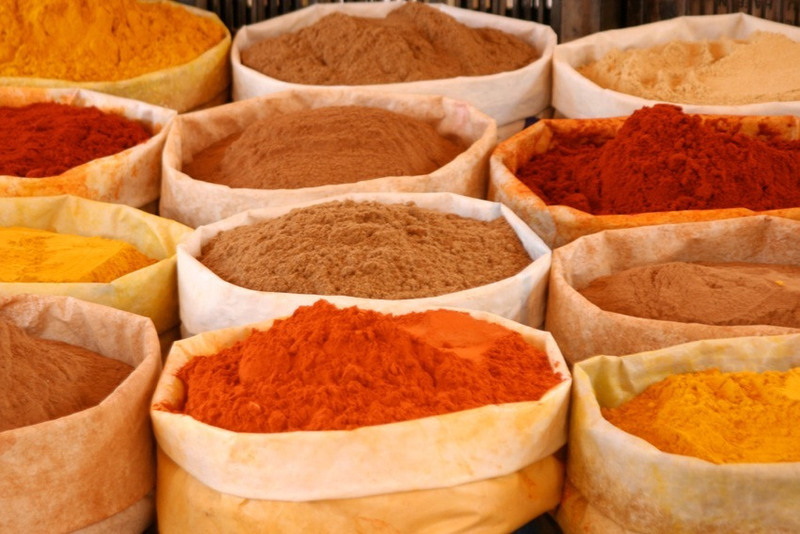 It is definitely the smell of Morocco; it is also evocative and of extremely high quality. Yet, for all that I think this is one absolutely marvelous scent and for all that I couldn’t stop sniffing my wrists in the beginning, I don’t think this is a scent for me. It is one of those rare perfumes that I think actually leans a little too masculine (despite being unisex) and it is also something that would be hard to wear every day. But, on the right man, though, I think that it would be rhapsody and heaven — the sort of scent that would make another woman or man want to sniff him for days on end and to dream of his scent. On a man, this is a fragrance that could make his spouse or significant other find it impossible to keep his or her hands to themselves. coriander, petitgrain, bitter orange, lemon, bergamot, jasmine, labdanum, geranium, cedarwood, vetiver, vanilla, patchouli and ambergris. L’Air du Desert Marocain opens with such forcefulness that my head spins. It is a good forcefulness, and I absolutely love it, but I recall Fragrantica‘s statement that this was made as a “lighter” version of Le Maroc Pour Elle and blink. Quite frankly, it is almost a little overwhelming in its spiciness, and I rarely say that. Yet, it explodes with such a marvelous opening that I find myself testing it out three different times on different places. And each opening was different. 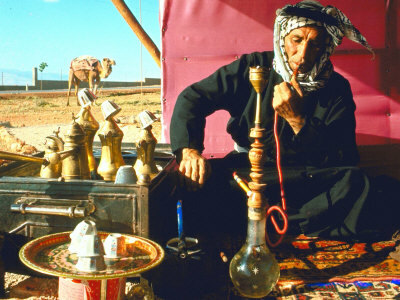 Tribal nomad smoking a hookah in the desert. 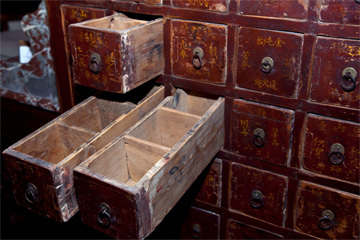 With the dust and wood undertones, I keep remembering an artsy, funky antique shop here which sells hundred-year old wooden Chinese apothecary cabinets; they smell faintly dusty, woody, and carry the lingering traces of old spices. 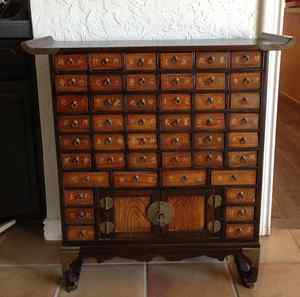 I go to my own spice cabinet and drawers, hoping to pinpoint exactly what spices I’m smelling here. I find nothing. My coriander does not smell exactly like the coriander in L’Air du Desert Marocain, and neither does my cumin. But those are mere powders and, from interviews that I’ve read with Andy Tauer, he seems to use the most expensive oils and distillations. It certainly smells like it. You can smell the incredible quality of the perfume. My second try with L’Air du Desert Marocain yielded a totally different, but equally fascinating, opening burst. This time, I smell lemoned coriander and tea. Amazing Earl Grey tea with notes of bergamot, an ingredient which falls between orange and lemon in scent. There is Earl Grey but there is also something else, something smokier, darker and almost tarred. It evokes Lapsang Souchang, a black tea which Wikipedia says “is distinct from all other types of tea because lapsang leaves are traditionally smoke-dried over pinewood fires, taking on a distinctive smoky flavour.” The black, bitter, smoky tea is tinged with pine notes but also the lightness of the bergamot and the piney aspect of cedar. I feel triumphant at finally pinning down one of the more elusive notes in the perfume, but I’m astounded at how different this opening is from my first go-round. My third try yielded a mix of my prior two attempts. This time, the opening was of cedar, lemon, vetiver and pine needles with a strong element of dust. Actual dust! The wood and dust notes are complimented by the earthy sweetness and amber notes of the vetiver, but cedar is the predominant star here. This undulating wave of shifting notes is, in my opinion, a characteristic of a “prismatic” scent. The Perfume Shrine has a very thorough explanation of scents which may appear linear but which, in reality, have prisms and shifting weights amongst several key components. A variation on the linear scent is the “prism”/prismatic fragrance, whereupon you smell a humongous consistent effect all right, but when you squint this or that way, throughout the long duration, you seem to pick up some random note coming to the fore or regressing, then repeating again and again; a sort of “lather, rinse, repeat” to infinity. A good example of this sort of meticulously engineered effect is Chanel’s Allure Eau de Toilette (and not the thicker and less nuanced Eau de Parfum) where the evolution of fragrance notes defies any classical pyramidal structure scheme. There are six facets shimmering and overlapping with no one note predominating. Here, with L’Air du Desert Marocain, sometimes the opening gave me notes like the petitgrain, orange and labdanum, sometimes bergamot, coriander and cedar, and sometimes a combination of all three, including the base or bottom notes (the heavier molecular compounds which last longer on the skin). Regardless of which version I start out with, two hours in, the heart of L’Air du Desert Marocain starts to unfurl. It is pure labdanum, patchouli, and sweet incense with cedar and faint touches of cumin that, at this point, in no way smells like body odor or sweat. The overall impression is of spiced amber and perfumed wood. The sillage is slightly less overwhelming at this point, but there is still significant projection. Three hours later, the cumin starts to turn and shift a little. There is a faint, tiny element of sweat that creeps in. If you’ve read any of my reviews for perfumes with cumin, you will know that I’m highly sensitive to the scent of cumin and its inevitable turn to a sweat note. It happens on me each and every time, whether it’s Serge Lutens’ Serge Noire or Amouage’s Jubiliation 25. And, each time, I struggle with it. Here, it is fainter than it was in Serge Noire but, still, 6.5 hours, I have to give a faintly worried sniff under my arms. It’s my own issue and my own neurosis because, again, my nose is extremely sensitive to cumin (it’s why I can rarely cook with it). Here, it’s very subtle, but the faint trace of body odor is definitely apparent at this point. 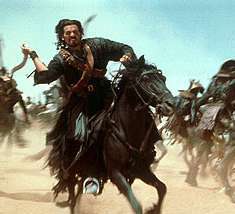 I can’t think of a celebrity whom I think embodies the L’Air du Desert Marocain man. This is not for Brad Pitt or Tom Cruise, nor for the Marlboro Man or John Wayne. 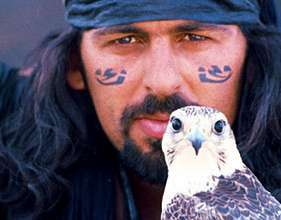 The character which consistently comes to mind is the Bedouin chief, Ardeth Bay, played by Oded Fehr in The Mummy (1999). Or Omar Sharif’s character in Lawrence of Arabia. Women can certainly wear L’Air du Desert Marocain and, again, it is officially a unisex scent “for women and men,” but I don’t think the majority of women would find this to be something they could wear daily. In fact, some men on a Basenotes thread I read found that it was perhaps a little too much for them, too. That said, I think it’s a fantastic scent and well worth a sample for those who like their scents spicy and heady. It will take you to the deserts of Morocco and, if you’re lucky, make you feel like a Bedouin king. Sillage & Longevity: This thing lasts and lasts! My skin consumes perfume voraciously and, yet, L’Air du Desert Marocain had serious projection or sillage for the first 2.5 hours, then slightly less for the next hour, and only becoming close to the skin a little under 5 hours in. Nonetheless, it was still easily detectable at that point any time I brought my nose to my wrist. In terms of longevity, it lasted just under 10 hours on me, which is pretty remarkable. On others, the fragrance is reported to last eons with only a few sprays, so I wouldn’t be surprised if it lasted a good 16 hours on someone, if not far more if you used a lot. Cost & Availability in General: In the US, you can buy a 1.7 oz/50 ml bottle for $125 from Luckyscent and The Perfume Shoppe, as well as directly from Tauer Perfumes from February 2013 onwards. (See further details below in the Tauer section.) If you want to order now from Lucky Scent, please be aware that they are backlogged until the end of January 2013 on all orders for the perfume. They also sell a sample vial for $4. Samples are available from Surrender to Chance as well, starting at $5.99. In Europe, First in Fragrance sells the perfume for €95.00 for a 1.7 oz/50 ml, or for €190.00 for a 3.4/100 ml bottle from. It too carries samples. In the UK, Les Senteurs carries the Tauer line but the online website only seems to carry samples, not the full bottles. It may be different in the actual stores, but you will have to check. I don’t know about the shipping rates for any of those sites. The Tauer website’s store locator also provides locations in over 10 countries — ranging from France and the Netherlands to Russia, Singapore, the UK, Poland, Romania, Spain and more — where its products are available. You can find that list of stores here. 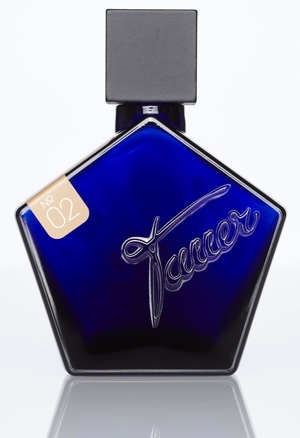 Cost & Availability from the Tauer Website: The Tauer Perfumes website lists the cost of the 50 ml/1.7 oz bottle as as: Fr. 96.00 / USD 103.70 / EUR 79.70. Tauer Perfumes also sells a sample 1.5 ml/ 0.05 oz glass vial of L’Air du Desert Marocain for: Fr. 6.00 / USD 6.50 / EUR 5.00. Though they used to ship to most places in the world, you need to know that they can’t ship to a number of places in Europe right now and that they will only be able to ship to the U.S. from February 2013 onwards. For various reasons due to a sudden problem with their shipping supplier, as of this post in January 2013, they say that they can only ship to customers in Switzerland, France, Germany and Austria. They also state they they hope to remedy this situation soon. This entry was posted in Ambers, Smoke or Spice, Fragrances, Men's Colognes, Orientals, Perfume Review, Tauer Perfumes and tagged Andy Tauer, Andy Tauer L'Air du Desert Marocain perfume review, L'Air du Desert Marocain, L'Air du Desert Marocain perfume review, perfume reviews, Tauer Perfumes, Tauer Perfumes review by Kafkaesque. Bookmark the permalink. Isn’t L’Air du Desert Marocain gorgeous? It’s one of my favourite fragrances in Tauer range. It’s kind of unique – I mean there are hundrets of spicy perfume but this one smells different, better and more mysterious comparing to others. If you have time go and see my today’s review. Hope to talk with you a little bit about it there. Reverie au Jardin is magnificent. I’ve never encountered a perfume that combines iris and lavender. Thank you for the recommendation, Lucas. And nice review! I’m afraid I’m not a fan of lavender scents or powdery ones to some extent, so the combination of the two together probably won’t be very appealing to me. But I’ll definitely keep Reverie au Jardin in mind if every someone wants a recommendation for a lavender-based perfume. Thank you again! I like the Tauer scents I’ve tried and this one is a favorite. Incense Rose is one that I didn’t like at first but it grew on me. There are a few more I want to try and eventually I’ll probably get the sample set to do that. This was a wonderful review and I always find it fascinating to hear of a fragrance that you feel is genuinely masculine. I would be running to buy a sample (I have loved some VERY masculine things) if I hadn’t already tried this and had a weird experience. I was one of the people who nearly couldn’t smell this at all. (Reviews on Lucky Scent.) I have smell issues sometimes because of Lyme disease but it is always the opposite- I perceive something as overpowering or nasty, not nonexistent. Since all those comments came from the same place it makes me wonder if it was an off bottle. Is there something you could do to a perfume bottle to turn it to water? Interesting, Nancy. I would almost wonder if you had selective anosmia towards some of the notes, except you said that you couldn’t smell ANY of them and I know you can smell a wide variety of notes in general. Do you know about Anosmia, btw? http://www.dailymail.co.uk/health/article-2026464/Anosmia-Wonder-like-sense-smell-It-stinks.html People can be anosmic towards selective notes; musk or cumin-curry ones seem to be high on the list. But, again, here you smelled absolutely nothing at all. And this is hardly a scent that smells like water. I wonder if the perfume sample you got was simply off? Given that more than one person said the same thing on the place where you all got your sample, I have to suspect it was the bottle and not you guys! I love spicy scents, but this one is magical to me. I agree that it’s not really a day-to-day wear, but this is one of the “best value” scents I own in that it’s of (IMO) extremely high quality, is very unique, and I get great silage and longevity. I also really love Lonestar Memories, but that one seems to be very polarizing and it’s even less versatile than this one. But still, both of them to me capture the utter essence of their title and description, which I personally find to be a very rare quality. So Andy Tauer gets an A+ in my book! I thought this was a nice perfume, but a bit too dry for my liking, but you do such wonderful job of drawing a person in to your enthusiasm that I think I may have to bring out my sample box and give this another try. As always, your posts are most excellent my dear S! I should start with saying that I’m a big Andy Tauer’s fan but not that much of his perfumes: out of 13 I tried Iliked only 4. And L’Air du desert marocain is one of them. I doubt any Tauer’s perfume (or any other perfume to that matter) would be easy to wear every day for me but I’m considering a L’Air du desert marocain decant purchase. Have I ever mentioned how much I love your reviews, Kafka? Well, I do! I’m wearing this today for the first time, and it’s so beautiful and interesting and complex… but I haven’t been able to figure out why it doesn’t hit my button the way my favorite perfumes do. I can usually find some specific reason. With this one though, it’s so beautiful I couldn’t figure it out, but maybe it has to do with the too masculine thing you’re speaking of. I would definitely like to smell it on a man! I do really appreciate the particular blending of ambergris and labdanum in this, but there’s some rough, woody edge that bothers me a bit and give me a vague headache (Iso E again?). I have a tiny 2 ml decant, and I’ll wear it all and am quite glad to have gotten it, but it’s not a fb for me. It does fascinate me, maybe I’ll douse something huggable in it just to be near the smell without personally wearing it, which is probably strange…. It’s also one time I don’t quite like the cumin (again, on me), even though I very much like Aziyade, which is one people seem to frequently complain of the cumin.